I did it. I completed my first Daring Bakers Challenge. The January 2010 Daring Bakers’ challenge was hosted by Lauren of Celiac Teen. Lauren chose Gluten-Free Graham Wafers and Nanaimo Bars as the challenge for the month. The sources she based her recipe on are 101 Cookbooks and www.nanaimo.ca. I have never made graham crackers before, and decided to stick with wheat flours for this one being that I'm not gluten-free. These super sweet treats are popular in the Vancouver area, so in honor of the upcoming 2010 Winter Olympic games this was a great recipe to try. My first surprise was that the non-gluten free graham cracker recipe didn't require graham flour. I, like many others, assumed there must be something complicated involved with making these childhood favorites. Otherwise, why is it so rare to hear about homemade versions? After trying this recipe, I conclude it might be rare to see homemade versions because the sticky dough makes it a bit difficult to get the crackers as thin as store bought versions. This problem was partially remedied by chilling and rolling out the dough in small batches. I must admit that I didn't love this recipe's results. It had the familiar smell of graham crackers, that warm honey, molasses-y scent you know, but none of the mouth-feel of a true graham cracker. It wasn't grainy, but more solid like a tough cookie. I'm curious to know if the texture of the gluten-free version was truer to the original. Regardless, now that I have demystified graham crackers, I definitely think I would attempt homemade grahams again, but preferably using graham flour. Once the graham crackers were done, they were used to make graham cracker crumbs (this would have really bothered me, had I liked them enough to eat them plain). 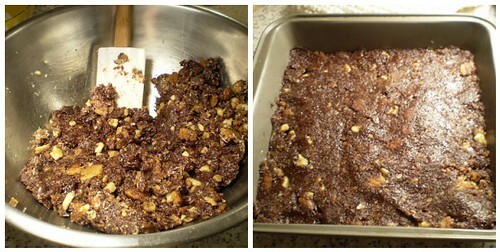 The crumbs are mixed with cocoa powder, shredded coconut, and nuts to form the bottom layer. I only had finely shredded unsweetened coconut on hand, and chose walnuts for the nuts. I intentionally left some of the graham crackers in bigger chunks rather than pulverizing the whole amount thinking it might be more interesting. Chocolate and grahams trigger thoughts of s'mores for me, and I think that was where the thought came from. The middle layer is the custard layer. It seemed more like a frosting flavored with the popular British custard powder, Bird's. It was mostly powdered sugar, blended with butter and a bit of milk (I didn't have cream on hand). Lauren, the challenge's host, mentioned this layer was the place to add in additional flavoring. I originally intended to do a mint flavor since it was a chilled bar with chocolate. Instead, I decided to stick with the Canadian theme and use maple syrup. I added two tablespoons in the hopes of being able to distinguish the maple flavor over all the icing sugar. The top layer was simply melted semi-sweet chocolate with a bit of butter. I added a shot of espresso that I brewed, hoping it would be a good counter-balance to all this sweetness. It's rare that I'm wary of the level of sugar in something, but these bars had me wondering if they might be an acquired taste. I do love the idea of how easily the basic formula can be adapted to different flavors. I'm also thankful I got to learn a little bit about a dessert I had never heard of. I would rather be trying one of these sweets in Vancouver, but when I make it there eventually, I'll know to look out for them. Meanwhile, I have the perfect figure-skating watching snack waiting in my freezer for when the games start. 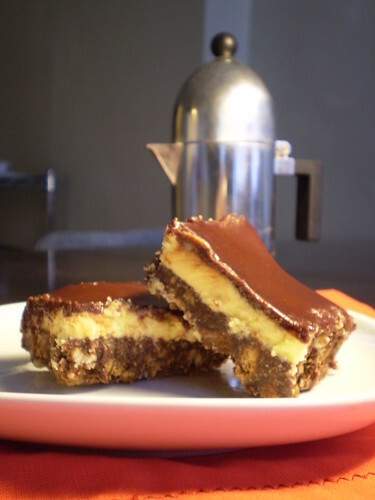 Espresso-Maple-Walnut Nanaimo Bars I have reprinted the recipe with the few changes I made. The recipe for homemade graham crackers is below. 1. 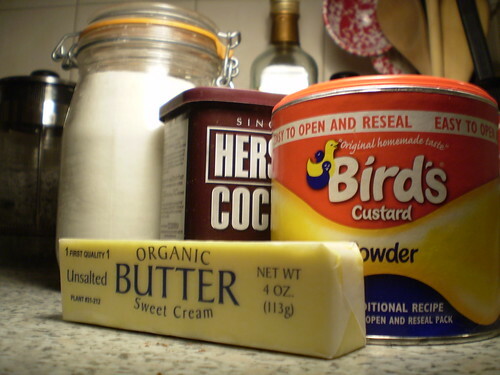 For bottom Layer: Melt unsalted butter, sugar and cocoa in top of a double boiler. Add egg and stir to cook and thicken. Remove from heat. Stir in graham crumbs, nuts and coconut. Press firmly into an ungreased 8 by 8 inch pan. 2. For Middle Layer: Cream butter, cream, custard powder, and icing sugar together well. Beat until light in colour. Spread over bottom layer. 3. For Top Layer: Melt chocolate and unsalted butter over low heat. Cool. Once cool, pour over middle layer and chill. 1. In the bowl of a food processor fitted with a steel blade, combine the flour, brown sugar, baking soda, and salt. Pulse on low to incorporate. Add the butter and pulse on and off, until the mixture is the consistency of a coarse meal. 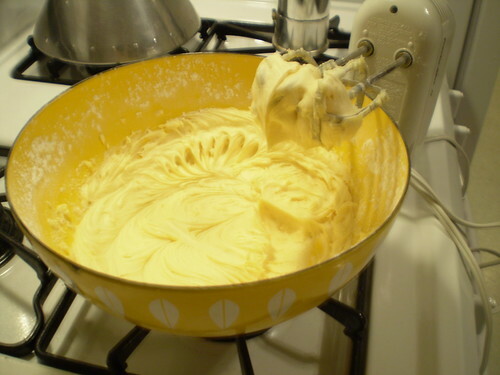 If making by hand, combine aforementioned dry ingredients with a whisk, then cut in butter until you have a coarse meal. No chunks of butter should be visible. 2. In a small bowl or liquid measuring cup, whisk together the honey, milk and vanilla. Add to the flour mixture until the dough barely comes together. It will be very soft and sticky. 3. 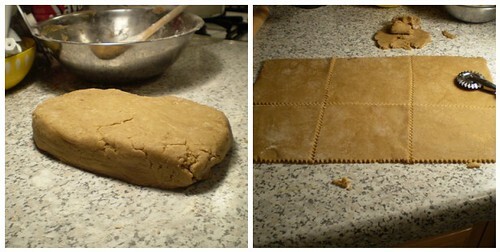 Turn the dough onto a surface well-floured with sweet rice flour and pat the dough into a rectangle about 1 inch thick. Wrap in plastic and chill until firm, about 2 hours, or overnight. 4. Divide the dough in half and return one half to the refrigerator. Sift an even layer of sweet rice flour onto the work surface and roll the dough into a long rectangle, about 1/8 inch thick. The dough will be quite sticky, so flour as necessary. Cut into 4 by 4 inch squares. Gather the scraps together and set aside. Place wafers on one or two parchment-lined baking sheets. Chill until firm, about 30 to 45 minutes. Repeat with the second batch of dough. 5. Adjust the rack to the upper and lower positions and preheat oven to 350 degrees Fahrenheit (180 degrees Celsius). 6. Gather the scraps together into a ball, chill until firm, and reroll. Dust the surface with more flour and roll out the dough to get a couple more wafers. 7. Prick the wafers with toothpick or fork, not all the way through, in two or more rows. 8. Bake for 12 minutes, until browned and slightly firm to the touch, rotating sheets halfway through to ensure even baking. Might take less, and the starting location of each sheet may determine its required time. The ones that started on the bottom browned faster.